Rutabaga or Brassica napobrassica belongs to the Brassicaceae family (formerly Cruciferae), like cauliflower, radishes and other cabbages. When its flesh is yellow, this vegetable is also called swede. This plant likes climates where winters are cold and moist and can reach 12 to 16 inches (30 to 40 cm). 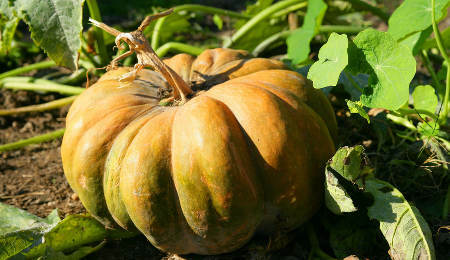 This healthy vegetable can be harvested and eaten during fall and winter. There are many known cultivars, such as the red-crowned ‘Champion à collet rouge’, the ‘Globus’, the ‘Oestgoeta’ and the ‘Virtue’. Crown color can range from purple to green or red. It is sometimes also called the “Swedish Turnip”. Often neglected, this vegetable provides many health benefits. Read on to discover more! Read also: how to grow rutabaga. 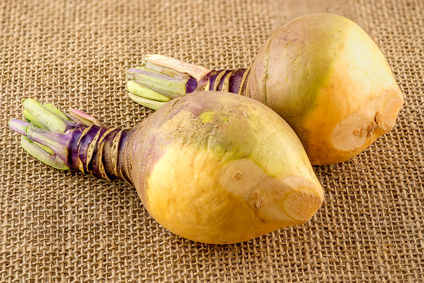 Discovered at the end of the Middle Ages, rutabaga originated in Scandinavia. It resulted from a cross between kale and a turnip. The word “rutabaga” in Swedish actually means “cabbage-turnip”. 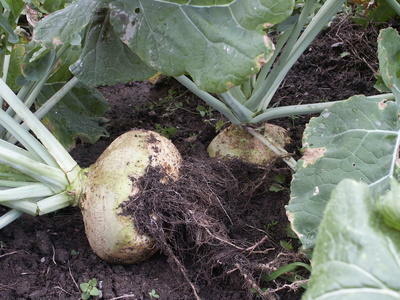 Rutabaga arrived in England, France, America and other western countries in the XVIIIth century. This vegetable was literally a survival crop during World War II. It replaced potatoes that had been confiscated by the German occupation. Connected in the popular subconscious to war and dire need, rutabaga fell into oblivion. Although previous generations considered it a poor man’s meal, rutabaga today makes a comeback for the greatest joy of our tastebuds. It is grown in the wetter and colder regions of the world. Rutabaga greatly speeds up intestinal transit. It helps digestion in case of constipation and weak intestines. Regularly consuming rutabaga is effective to avoid fungal growth along the digestive tract. Specifically, Candida albicans growth is inhibited. It is an amazing anti-fungal. This root vegetable is an excellent source of vitamin C, a nutrient that is essential to the body. Indeed, it is a powerful antioxidant that protects us from free radicals, stimulating our immune system and reducing cell degeneration. Further antioxidant compounds help avoid cancer and premature ageing. Great for the heart, rutabaga regulates arterial blood pressure thanks to its high potassium (326 mg / 3.5 oz (100 g)) contents and alleviates heart disorders. This reduces the risk of developing cardiovascular diseases. Moreover, this vegetable carries absolutely no bad cholesterol, which our arteries can only be grateful for. It is an amazing diuretic. It can even be pressed for juice: it averages 90% water content. With lower sugar content than potatoes have (9g of sugar for 3.5 oz (100 g) of root), rutabaga helps lose weight. It can be a great addition to the diet of diabetic persons. Pulmonary disorders are also alleviated for persons suffering of asthma, when they ingest rutabaga. Rutabaga is recommended in case of urinary retention, constipation, or to detoxify the intestines and ease digestion. Some have found rutabaga leaves to be effective in case of painful migraines. Rutabaga provides many minerals and helpful nutrients for the body to grow and operate: potassium, sodium, phosphorus, magnesium, iron and zinc. Vitamins B1 and B6 play a role in the body’s metabolism as well. After having been forgotten for decades, rutabaga is now making a comeback in our plates. Calorie intake: 38g / 3.5 oz (100 g). Fats : 0.22 g / 3.5 oz (100 g). Rutabaga is appreciated for its delicious nutty flavor. It can be eaten raw, but is most often cooked, steamed or fried. It requires more time to cook than turnips do, up to about 1 hour. Peel it beforehand! Baked with cheese and potatoes is a great way to accommodate it, or more traditionally it can be added to soup or mashed to prepare puree. Grate it to make delicious salad. Rutabaga leaves can be eaten, too, in the same manner as spinach, or blended into soups. Rutabaga replaces potatoes very well in any recipe. Color pieces of rutabaga in a frying pan with a dollop of liquid honey, a few pinches of cinnamon and nutmeg with a little bit of water. Simmer on low, until tender to the core. Keeping rutabaga Rutabaga keeps for a week in a dark room at ambient temperature, or several weeks if wrapped in paper and stored in the vegetable compartment of your refrigerator. How to choose your rutabaga Prefer small, firm and heavy rutabaga. When peeling, remove the core if it has a brownish color. Rutabaga is the most wonderful vegetable available. I found Rutabaga to facilitate digestion. Great share.